Pre-heat oven to 170°C/340°F (convection). Beat eggs until foamy and light in color. Mix sugar and part of the melted butter, then add to the egg mixture. Mash up part of the bananas and add to the egg mixture together with vanilla extract. Add buttermilk and mix well for a couple of minutes. Combine all dry ingredients—incl. flour, baking powder, salt, and speculaas spice (instead you could use cinnamon mixed with a pinch of nutmeg, cardamom, ginger, cloves, and allspice). Sieve dry ingredients into the batter and mix until well combined. Super tasty even raw—quality control is important ;-)! Divide batter among muffin tin, lined with paper cups. Cut banana into preferred shapes, for example slices, half- or quarter-slices, then place some on top of each muffin. 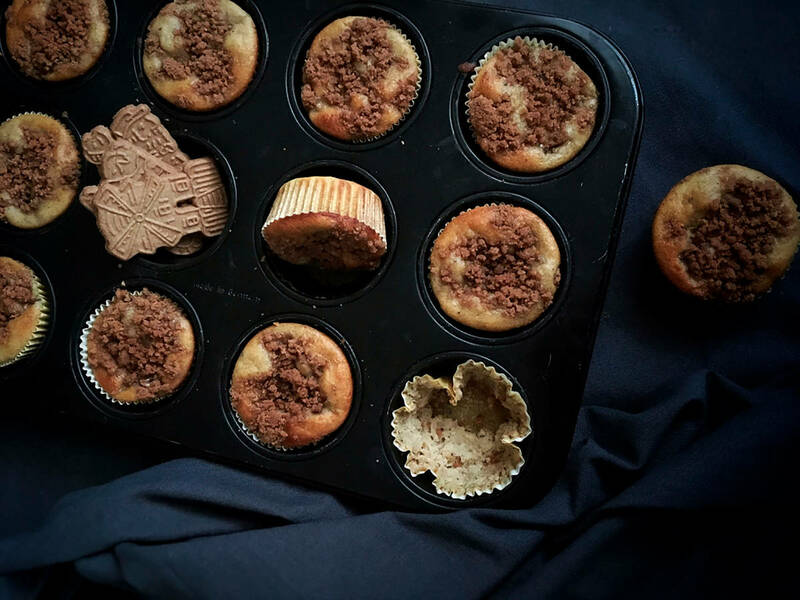 In a separate bowl, combine melted butter and speculaas cookies (crushed), then add to each muffin as a topping. Bake in pre-heated oven at 170°C/340°F (convection) for approx. 25 min., then transfer to a cooling rack. You can eat the muffins warm (which I prefer) but they can stick to the paper cups if they are too warm still. The next day, they will taste lovely if heated up in a microwave for 30 – 60 sec. They will keep in an airtight container for 3 – 4 days and stay nice and moist.